Who doesn’t love bread? Who doesn’t love a heaping, unhealthy dose of carbohydrates? I’d been eyeing the PPK’s recipe database recipe for Vegan Challah for some time now. With three overripe banana’s sitting on the counter, begging to be used in something sinfully wheaty, I spent this afternoon kneading and mixing and kneading and waiting and waiting and baking. 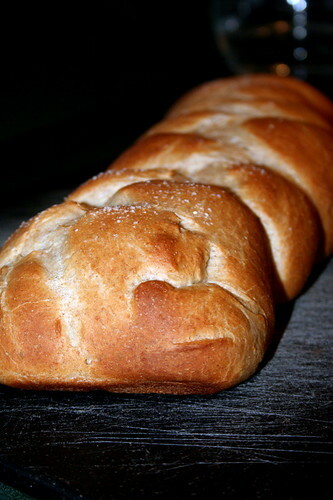 Honestly, it’s a lot of work–I guess not more than usual for bread, but I never bake bread–but totally worth it. I took a couple hours break while it was rising to go grocery shopping at the Dekalb Farmer’s Market and put the dough in the fridge to chill until I got back home, and I don’t think that affected the bread. My braiding technique could use a bit of work, but the bread is just so tasty. Oh, and in case you were wondering, it doesn’t taste like bananas at all! ::edit:: I just noticed that I forgot to use 1 cup of soy flour. Huh. Oh well…I wonder what the difference is… oops! In one small bowl, dissolve yeast in the warm water, put to the side to stand for 5-10 minutes. Mash bananas in other small bowl. In large bowl mix: oil, sugar, salt, and boiling water, stirring so it’s all mostly dissolved. Add the cold water to the large bowl (the mix should be warmish now but not hot). Stir in yeast mix. Turn out onto lightly floured surface. Knead for 5-10 min, dough should be smooth, not too stiff or too runny. Lightly coat the large mixing bowl in oil, turn the dough in it to just coat it with oil, place a towel over the dough in the bowl and let it rise for about 1 hr, till double in volume. Punch dough down, turn out and knead again 2-3 min. 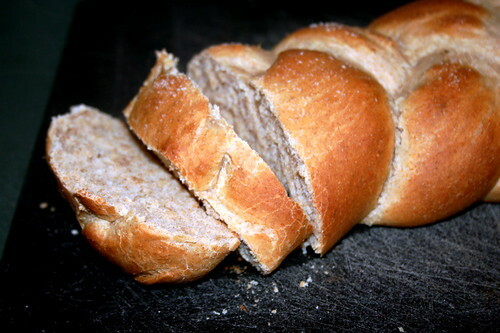 Divide dough into 2 balls, divide each ball into 3 sections, roll each section into long ropes and make 2 braids. Preheat the oven to 350. Let the braids rise 45 min. Boil a little more water. Just before putting braids in the oven, brush them with boiling water, then sprinkle with sesame seeds, poppy seeds, or sea salt. Bake 30 min. You’ll know they’re done when you tap them on the bottom and they sound hollow. Let cool on a drying rack for 10 min before slicing. Enjoy! I never add the soy flour either. I actually have a modified version of that bread that I’ve been using that makes the steps a little bit simpler. But yeah, it totally doesn’t taste like bananas! I love it.